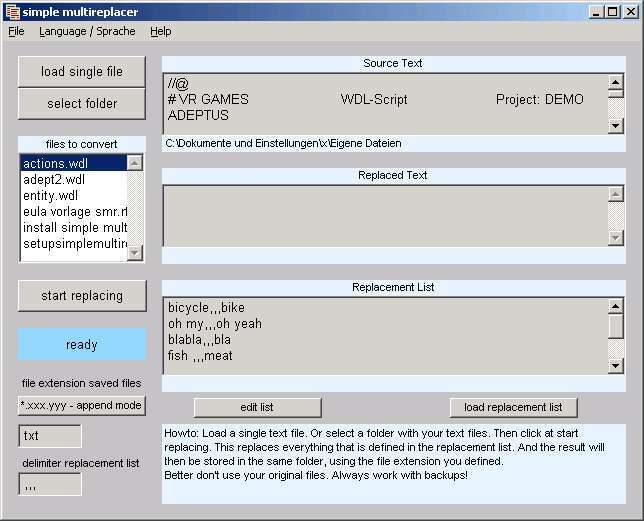 Simple Multireplacer is a simple tool to convert multiple strings in multiple textfiles with one mouseclick. Useful when you want to change codesnippets to another syntax. Or when you want to change the copyright string in several html files. When you again and again want to replace the same strings in multiple documents. Simple Multireplacer should be able to open any file you can open with the editor. *.txt, *.htm, *.etc. Load a single text file by clicking at the load single file. Or select a folder with your text files by clicking the select folder button. Better don’t use your original files. Always work with backups! Note: like most text software is my Simple Multireplacer not able to change text that goes across a line break. So don’t wonder when it sometimes fails with longer tags/phrases. Chances are good that a line break is in the way. This is no bug but simply the way it is.